On April 10, 1912, the “unsinkable” RMS Titanic set sail from Southampton to New York. To book their passage, many of its wealthy seagoing passengers ascended the stone steps of Oceanic House, headquarters of the White Star Line in London. The Titanic calamity spelled a long, slow death for the White Star Line, and Oceanic House, lavishly built in 1907, fell into decline. But now, after a circa $35 million restoration, the 33,000-square-foot building has been converted into seven luxury residences priced up to about $27.5 million. 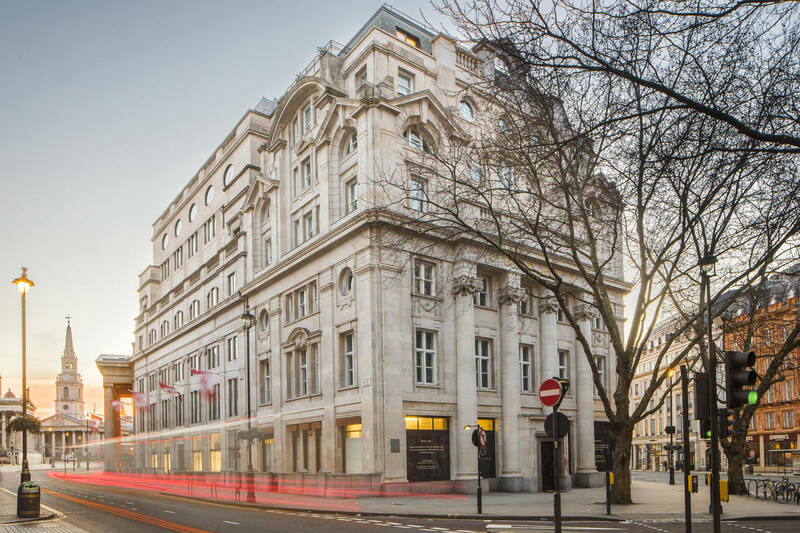 When London-based Misland Capital bought Oceanic House in 2012 for around $28 million, the building, located in the St. James neighborhood of London’s West End, was in a sorry state. After being sold by the White Star Line it was sold on to a bank, the British government and eventually to a kitschy Tex-Mex restaurant. The biggest structural challenge of the renovation was to remove the ugly dormer and rebuild it, using Welsh slate tiles to clad the roof and Portland stone to recreate its original decorative pediment. 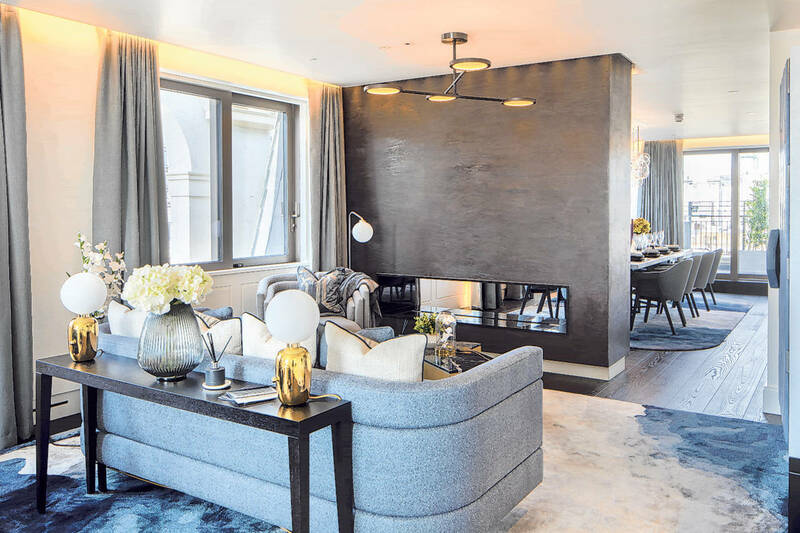 This space now holds the penthouse’s open-plan living room and dining room, divided by a double-sided fireplace, with views of the Palace of Westminster and Big Ben from one of its two terraces. “You will not need a clock in this apartment, that’s for sure,” said Simon Fernandes, a partner at Strutt & Parker, the apartments’ joint selling agent along with Beauchamp Estates. The decor is simple: dark timber floors and a monochrome color scheme enlivened by touches of a rich, deep blue—a nod to the ocean. The Poggenpohl kitchen has a mix of taupe gloss and charcoal cabinets. There is also a study and second living room. The property comes furnished right down to spaghetti waiting to be boiled on the cooktop. The penthouse’s lower floor, accessed by a black polished plaster stairwell, has four bedroom suites, some with original porthole windows. 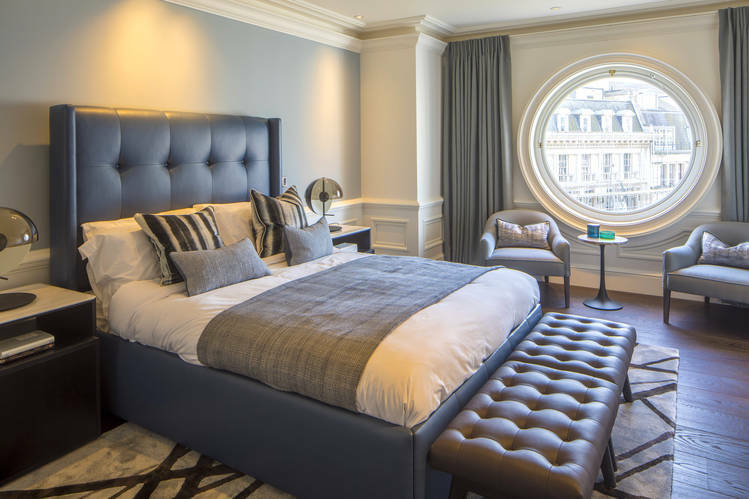 Wood paneling is a constant theme, a subtle nod to the décor of Titanic’s first-class cabins, but interior designers Morpheus London have kept overt nautical references firmly in check. This 5,496-square-foot penthouse is listed for about $27.5 million, while apartments—in rooms where the White Star Line’s clerks would once have had their offices—start at $6.1 million for a 1,604-square-foot, two-bedroom property. One of the seven apartments has already been sold to a German-American couple. In the seven weeks since they formally went on sale, Mr. Fernandes said second-home buyers from China, South Africa, North America, and Europe, as well as British buyers looking to downsize from country houses, had expressed interest in Oceanic House. In terms of its location, St. James’ sits on the fringes of prime central London and lacks the cachet of, say, Mayfair or Knightsbridge. However Mr. Fernandes pointed that Oceanic House, seconds from Trafalgar Square, has an average price of $4,200 per square foot. In prime central London average prices are typically between $5,600 and $9,800 per square foot. Prime London prices have taken a Brexit-related hit since 2014, with average falls of around 7%, according to estate agent Knight Frank.